Minka Lavery chandeliers combine elegance with contemporary charm to create high-quality chandeliers that will immediately become the statement piece of your home. 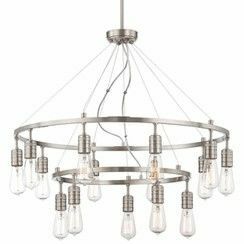 If you’re looking for something on the simpler, more contemporary side, the Minka Lavery Downtown Edison Chandelier will definitely appeal to you. For something more ornate, the Minka Lavery Salon Grand Light collection of chandeliers will surely take your breath away with it’s beautiful and intricate designs. Whatever your tastes and design vision are, Minka Lavery chandeliers are the perfect choice when it comes to elegance and chic style. Any interior designer will tell you that lighting fixtures are one of the most important features of your home. It doesn’t matter how much money, time, or energy you put into creating the perfect home décor; if you have poor lighting, all those efforts will have been in vain. Poor lighting can make furniture and wall colors appear dull. It can also make a space appear smaller than it actually is, or simply make the space feel dark, dim, and unwelcoming. Your home is your sanctuary. It’s where you come home after a long day’s work to rest and rejuvenate. It’s the place you share with your loved ones, or the place where you can find solitude and peace. Don’t let a lack of adequate lighting make it feel dingy. Installing proper lighting fixtures, like a Minka Lavery chandelier, will ensure that your home stays beautifully lit all year round, and that you can come home and enjoy the comfort and beauty of your home. If you need to upgrade your lighting fixtures, take a look at Minka Lavery’s collection of gorgeous chandeliers. Minka Lavery chandeliers are a great way to provide the perfect lighting solutions for your home because they don’t take up any floor or counter space; they just provide glamor, elegance, and light to any room. You’ll swing from the chandeliers when you hear that, not only does Minka Lavery manufacture beautiful, eye-catching, and high-quality chandeliers, but Crescent Harbor also offers a wide variety of Minka Lavery chandeliers at competitive prices. In other words, you can get the home decor you’ve always dreamed about without having to pay exorbitant prices. With a Minka Lavery chandelier hanging from your ceiling, you’ll instantly transform an otherwise mundane room into something spectacular and glamorous.